I am now able to concentrate more in class and sleep enough sleep because of reduced distance to water source. A year ago, generous donors helped build a hand-dug well for the Masola Kaani Self-Help Group in Machakos County in Kenya. Because of these gifts and the contributions of our monthly donors, partners are able to visit project sites throughout the year, strengthening relationships with communities and evaluating the actual water project. These consistent visits allow us to learn vital lessons and hear amazing stories – we’re excited to share this one from our Africa Sand Dam Foundation (ASDF) partners, Mutheu Mutune and Titus Mbithi, with you. 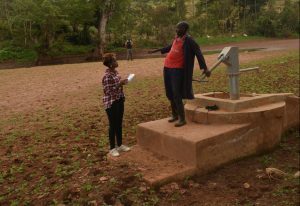 And thanks to the surplus of water an adjacent sand dam provides, this well is able to pump drinking water from the catchment area. Mwendwa Mumo pumping water from the hand-dug well. 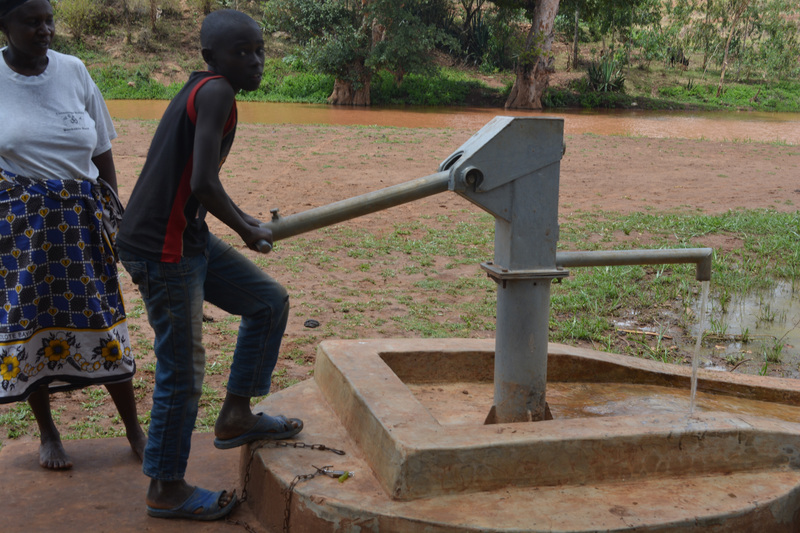 The community has seen transformation in the area with increased access to water. Many in the community, like Damaris Mumbua, have been able to plant crops of maize, kale, and fruit trees to provide food for the family and to also sell as cash crops. Mutheu Mutune observes the changes that she has seen in her work in Masola Kaani, stating, “The environment is very green and serene indicating that the people have utilized the water well.” Water access enables everything from brick-making to animal husbandry to improved farming and health. Damaris Mumbua sharing how having water nearby has changed her life. However, this is also a community that has witnessed water issues that are beyond the control of the community itself. Joseph Kioko, the communications officer for ASDF reports, “There’s a sewerage system that’s channeled to the river from Machakos town which needs to be redirected elsewhere.” This sewer system is a threat to the water quality in Masola Kaani and ASDF is working to link the group with the department of public health at Machakos county government so that they can address the issue jointly, as it poses a threat to health of people accessing their drinking water from the river. In addition, ASDF conducts water tests so that each community is aware of the quality of water at their source. 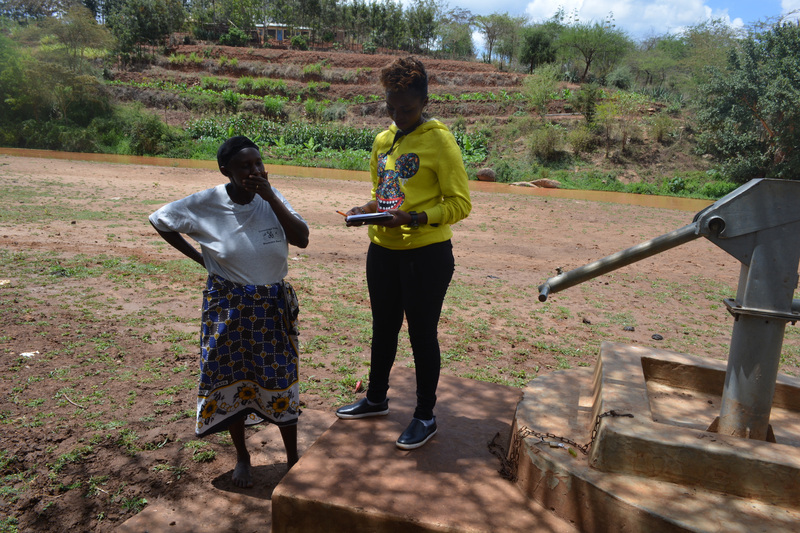 Masola Kaani is a good example of the importance of long term relationships between ASDF and the communities that they serve, so that through monitoring and evaluation these communities can address issues such as this one with the resources of ASDF, The Water Project, and donors like you. ASDF keeps working until the community has reliable, safe drinking water. We are excited to stay in touch with this community and report back more positive stories. When you invest in The Water Project, you're investing in people like Mwendwa Mumo. Your gifts help us reach more communities with the gift of clean, safe water. And every drop helps unlock potential.